Where do I stay during off peak months in a campervan? Home > Blog > Where do I stay during off peak months in a campervan? 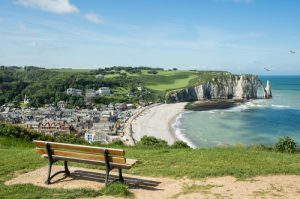 If you are considering a campervan break in France during the off peak months (late October to Easter) you may be wondering if campsites and other places to stay remain open outside of high season. This being France, where motorhome travellers are made most welcome, there is still a huge choice of places to stay. Whilst most campsites will close between November and Easter, some remain open year round and the vast majority of “aires” (free or very inexpensive overnight halts in towns and villages) and “France Passion” sites (free places to stay on farms/vineyards and other great locations) stay open all year. In addition, it is a particularly good time of the year to park up overnight in less formal spots. With less pressure on car parks near tourist attractions during the quieter months there are lots of opportunities to stay overlooking beauty spots, near celebrated restaurants, in city centres and even in picnic areas. Come for a break within the next five months and discover the true freedom of a campervan trip in France.